This section contains subjects from Miscellaneous to Pottery & China. We are in the process of adding material to all categories. Please see Magazine Ads & Illustrations R-Z for subjects from Radio/TV to World War II. The magazine name and date of publication comprise the item code at the beginning of each description. 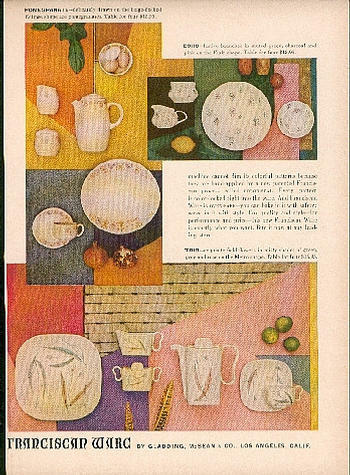 For example, BHG-239-13 means Better Homes and Gardens, February 1939, item 13 in a group of ads or illustrations from that issue. Weekly magazines, such as Life and Saturday Evening Post, include the month, day and year of publication. For example, L-72637-16 means Life, July 26, 1937, item 16. 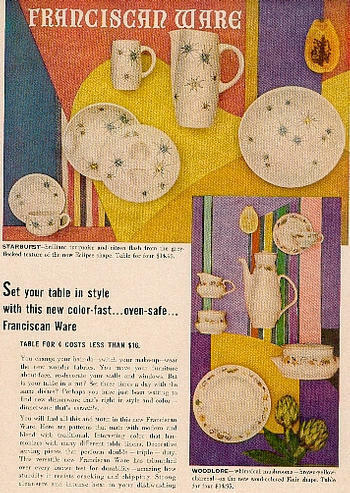 SU-554-01: "Starburst" is one of five patterns of Gladding McBean's Franciscan Ware featured in Sunset in May 1954. The two-page ad also pictures "Woodlore," "Pomegranate," "Echo" and "Trio." To order copies, please see Pottery & China: Magazine Ads & Illustrations - Color.